On February 24th, Hoosli Male Chorus, as part of their 50th Anniversary Celebrations, sang the Divine Liturgy at Holy Trinity Metropolitan Cathedral. The service was celebrated by Frs. Gene Maximiuk, Taras Udod, Chancellor of the UOCC; Andrij Duda (Military Chaplain from the Orthodox Church of Ukraine); Deacon Bob Hladiuk. His Eminence Metropolitan Yurij was in attendance. At the end of the Liturgy His Eminence led a Panakhyda service to commemorate the memory of the Heavenly 100, who gave their lives during the Revolution of Dignity in Ukraine in 2014. This year marks the 5th Anniversary of their sacrifice. His Eminence also spoke to the congregation about the importance of this event in the life of Ukrainians around the world. ПАМ'ЯТІ НЕБЕСНОЇ СОТНІ! ГЕРОЇ НЕ ВМИРАЮТЬ! His Eminence Metropolitan Yurij celebrated the Parish Feastday. Holy Trinity Cathedral also recognized Graduates for 2017 during the Parish Dinner. Great and Holy Paschal Celebrations with His Eminence Metropolitan Yurij at the Ukrainian Orthodox Metropolitan Cathedral of the Holy Trinity in Winnipeg, MB. Palm Sunday 2018 - A Hiearchical Divine Liturgy served by His Eminence, Metropolitan Yurij. Serving clergy included Rev. Fr. Gene Maximiuk and Deacon Bob Hladiuk. Assisting in the altar where the Cathedral Acolytes. Pussywillows were blessed and distributed to the faithful. 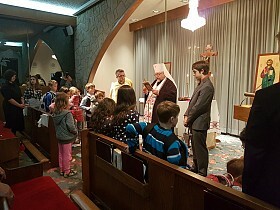 On September 25, 2016 the children and youth of Holy Trinity Cathedral has their backpacks blessed by Metropolitan Yurij. His Eminence addressed the children, encouraging them to have a successful school and church school year. He then read a prayer and blessed each child individually. Holy Trinity Cathedral Church Family celebrated the beginning of the Church Year with an Outdoor Liturgy and Parish Picnic at Kildonan Park, on September 16. It was dedicated to the 100th Anniversary of the UOCC. Although the day was dreary but the sun came out for the afternoon and the mood of the congregation was warm and joyous. The Divine Liturgy the BBQ Team fired up the grills and a wonderful meal was enjoyed by all. A bouncy castle and ice cream truck rounded out the afternoon activities. Thank you to all who helped make this event a success. 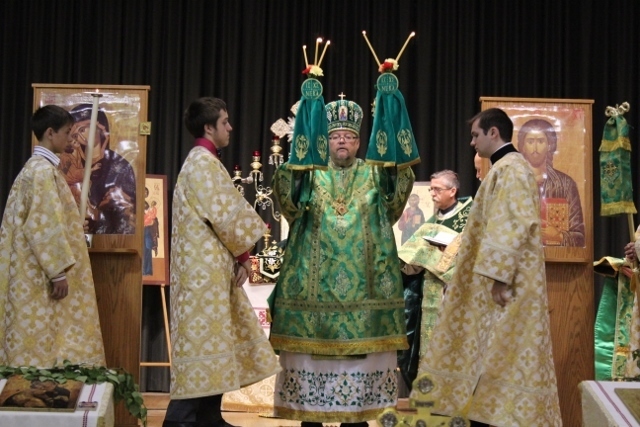 See also the video slideshow presented in honour of the celebration of the 25th anniversary of the Archpastoral ministry of HIS EMINENCE METROPOLITAN YURIJ of the Ukrainian Orthodox Church of Canada. A Reception was held on Friday, November 2, 2012 and included a wide display of photos and slideshow of the Cathedral. Also included was the video of the construction of the Cathedral. Everyone enjoyed the evening, sharing memories and recollections. 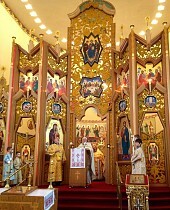 November 4, 2012 - Divine Liturgy - Family Sunday - pictures include the participation of youth for the Epistle Reading, holding of Candles during the Small and Great Entrance and the collection of the offering.